Sen. Will Raderman, U-at-Large, who sponsored the pro-unionization resolution, said at an SA Senate meeting Monday that there is a “massive disparity” between D.C.'s average living wage and the amount graduate students are typically paid. The Student Association Senate unanimously passed a resolution Monday supporting graduate student workers’ effort to form a union. The resolution called on the University to acknowledge graduate student teaching and research assistants as employees and hold a graduate student vote on unionization this semester. About 10 graduate students turned out to support the legislation, and seven student organizations endorsed it. Fifteen graduate senators sponsored or co-sponsored the resolution, in addition to one undergraduate. Graduate students first launched an effort to unionize in the fall, citing low wages and high healthcare costs as causes to negotiate with the University. Provost Forrest Maltzman said the University would not recognize the union earlier this month, saying graduate students served as teaching and research assistants as part of their educational experience and not as employees. Sen. Will Raderman, U-at-Large, who sponsored the resolution, said there is a “massive disparity” between D.C.’s average living wage and the amount graduate students are typically paid as TAs and research assistants. Graduate workers are typically paid about $25,000 annually, while a Massachusetts Institute of Technology Study found that the annual cost of living in D.C. exceeds $35,000. 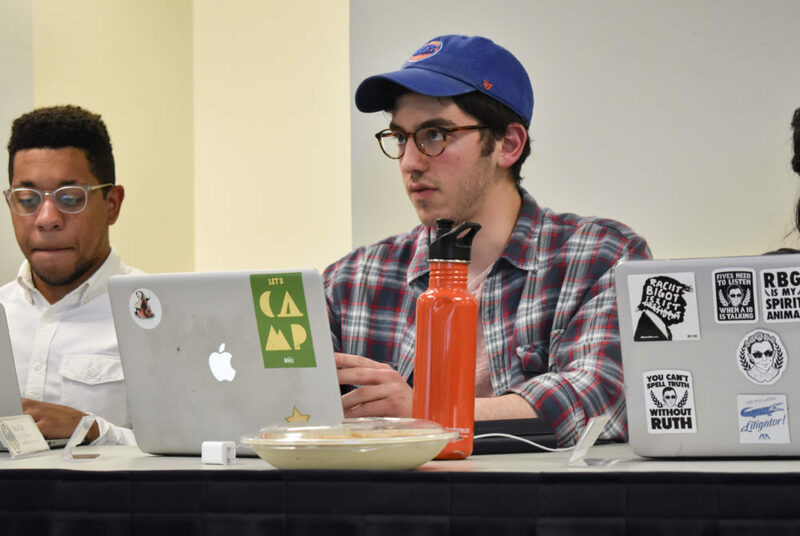 “It’s pretty straightforward, from that research, to support that graduate students should simply have the right to vote on graduates unionizing,” Raderman said. Sen. Brady Forrest, G-at-Large, who also sponsored the resolution, said because graduate students do not currently have a union, they have few avenues to tell administrators about thier concerns, like D.C.’s high cost of living, which he said limits their capacity to be student leaders of the University. “We’re really happy to be here and GW is a really great institution, a lot of good things come out of this, but it’s come to the point where it’s actually really hard to survive from day to day, eat enough food to survive, be able to pay rent,” Forrest said. After being rejected by the University, graduate students can still submit a petition to the National Labor Relations Board to make their unionization case – though the board under Republican presidential administrations has historically opposed student labor unions. Sen. Shaheera Albasit, CCAS-G, and a sponsor of the resolution, said having the support of a union would allow graduate students to be more effective teachers and perform better academically. “Not only are they able to seek better education, they are able to provide that as well,” she said. The senate also passed a resolution calling on officials to create online advising sessions and have more flexible advising hours to increase accessibility for graduate students. Sen. Katherine Perroots, ESIA-G, who sponsored the resolution, said living off campus places graduate students at a disadvantage compared to undergraduates, who often live closer to advising services. “I don’t come here during the day, a lot of graduate students work during the day and there were no hours outside of the 9 to 5,” Perroots said. Also at Monday’s meeting, Sen. Tyrell Garner, a first-year graduate senator, was also approved to serve as a senator for the Graduate School of Education and Human Development.